AAPL stock looks to have a well-defined price target for the near-term. Shares of large-cap technology stocks have seen some retracement over the past few trading days. While I don’t see this to be a reason for major caution, in the near-term, big names such as Apple (NASDAQ:AAPL) now look likely to see further mean-reversion to the downside. AAPL stock in specific now looks ripe to move toward a next lower price target that has plenty of relevance through the lens of technical analysis. Before digging into the trade idea, allow me to be clear that this actionable near-term trade idea should not be mistaken for a longer-term call on Apple stock. For what it’s worth, I personally continue to like AAPL as a longer-term portfolio holding and would not look to bet against the stock through this lens. That said, one of the key differentiators between successful traders and those churning their accounts is that the profitable ones are able to clearly distinguish time frames of their trading and investing ideas. In other words, a trade should be kept a trade and not turned into an investment and vice versa … all else being equal. With the aforementioned risk management approach in mind, let us gain some perspective on AAPL stock’s current situation. On the multiyear weekly chart, we see that thanks to the most recent rally, Apple stock reached the upper end of its multiyear up-sloping trend in late August/early September. In fact, the trend was marginally overshot. Just before last week’s new product announcement event, Apple started to lose upside momentum and slipped into a mean-reversion — or at the very least a price consolidation phase. And indeed there is plenty of historical data to show that AAPL stock tends to consolidate somewhat before, through or after a major product announcement event such as the one last week. On the daily chart, we see that the price consolidation phase thus far in September has led AAPL stock to make a minor lower high last week and now sits on clearly defined horizontal support around the $216 area. Considering the stock’s seasonal tendency, the technical picture and the price behavior of other large cap technology-related stocks over the past few weeks, I now see a good chance that Apple stock mean-reverts lower back to its yellow 50-day simple moving average. This moving average currently resides around the $208 area. As such, active investors or traders could look to either take near-term profits in the stock or even play for that next downside target. Option traders could consider buying some simple at-the-money puts or put spreads using options expiring no sooner than November. If AAPL stock decides to see more downside from here I would expect that price target to be reached within the next few weeks. 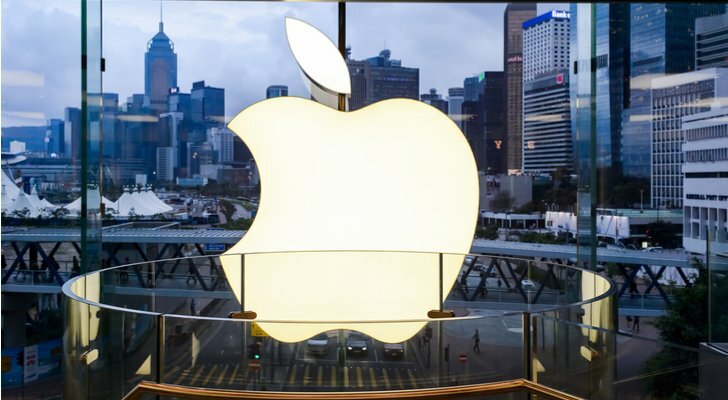 Article printed from InvestorPlace Media, https://investorplace.com/2018/09/trade-of-the-day-apple-stock-is-in-mean-reversion-mode/.